You've got me singing Caro - just as well you can't hear. Chives have fabulous flowers and it would be worth growing the plant for its ornamental value alone. I was really surprised by the strength of the taste when I first nibbled the flowers. I like the idea of a honey and chive dressing. Hope that you enjoy that salad. Haha! I wondered if anyone would pick up on the tune running through my head! I love the flowers (and, indeed, all alliums) but especially when they're edible too! And, yes, I can confirm the salad was delicious! Don't forget to deadhead your chives as well, Jo - so if you enjoy the dressing, you can go back for more! Plus the bees will love you if the flowers keep coming! I use the ice-cube-tray method for Basil pesto, but I have not done it with Chives. Might give it a go, because having "fresh" Chives in Winter sounds appealing. Oooh, I didn't know that I could freeze pesto - I'll definitely be giving that a try. Thanks, Mark! I think it's worth experimenting with freezing all sorts of herbs so that we don't go without in the winter. 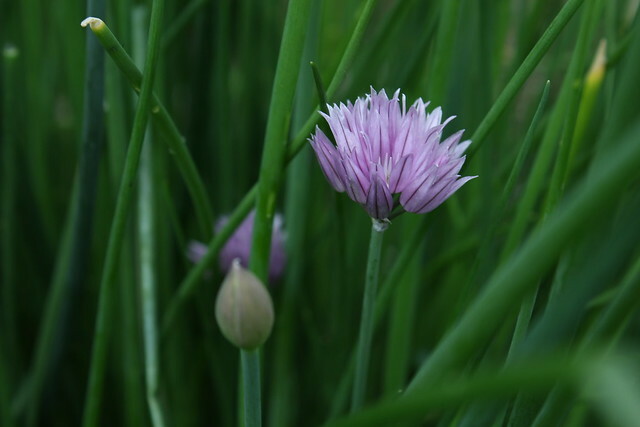 We have lots of chives at the allotment, they have self seeded themselves prolifically. I have never tried to tasting the flowers so maybe I should. The ice cube idea is very interesting. I wonder whether it would work for other herbs too. Ah yes, I remember having to pick out dozens of seedlings last year when I didn't deadhead in time. I think that this method of freezing without water may well work with other leaves that would otherwise turn to mush on defrosting. Worth a go, let me know how you get on if you try it? That's a great idea, VP. I think I saw similar at Capel Manor in the Which? trial gardens but had forgotten about it until now. It would look great and be cheaper than lavender! Thanks for the idea! I use chives in the ornamental garden as well as in the herb and kitchen garden. They are incredibly useful plants. I like the sound of the chive flower dressing - I will give it a go. I hope the juice diet has worked its magic. Great post-great sounding salad dressing. And I've never used the flowers nor have I dead-headed. Next trip to the allotment I will put matters right. Pleased that I've inspired you, Sue! This will keep the bees happy (or more happy), they love the alliums! my chives are hibernating for the winter, so you're making me really miss them! i must rmember to freeze them next season as you suggest. I have them growing throughout my ornamental garden too - the flowers are so pretty! You'll have to make a note in your diary for when your chives pop up again. I find that I forget a lot of the good ideas that I read about in blogs unless I write it down somewhere - maybe in a recipe book? The chive cubes are a brilliant idea! I thought you might like that - easy winter herbs. Great! A lovely fresh chives dressing! I love it too! :) Yummm! Thank you to everyone who leaves a comment, it helps to know that my scribblings are being read! If you have a question, I'll answer it here or contact me via the 'Contact Me' form at the top. Comment moderation is on to avoid spam nonsense getting published. No offence to genuine commenters who are very welcome!